Oxygen deprivation (from the treadmill) + bad play (from the television) = my mind has some problems. First and foremost, I want to apologize to Adrian for getting his name wrong in the video. As you can imagine, I didn’t feel like recording this afresh after I was done. Second: did anyone want to win this game? Sure didn’t seem like it. If Adrian doubles his score, he’ll have 23,200. 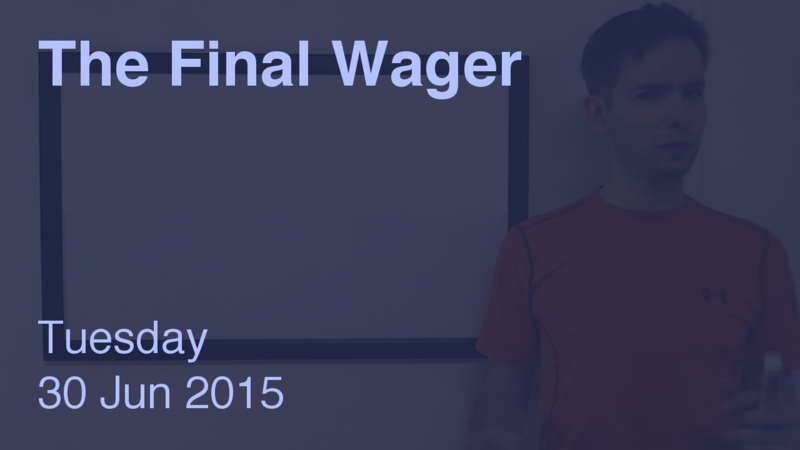 To cover this all-in wager, Brandon will need to wager 10,800. An incorrect response with that wager will leave Brandon with 1,600. To stay above his total, Adrian can wager up to 10,000. Amy can wager up to 4,600. A successful doubling will put Amy at 12,400. To cover this, Adrian should wager at least 800. Brandon could wager at most 0. Now things are getting spicy. If Amy goes for that 4,600 wager, Brandon could wager up to 1,600, and Adrian up to 800 – hot, hot, hot! Adrian should wager at least 2,400 to cover that possibility from Brandon. 1 1,599 6,200 ! 800 ! All right, so not quite so bad here. But again, someone had to win. Brandon has now won 2 games and $38,788. Kevin, has anyone missed the single jeopardy daily double clue, two double jeopardy daily doubles, and the final jeopardy clue and locked out their opponents like Brandon did yesterday? This video was amazing in ways that are hard to describe. I think it’s just the relatability of trying to do arithmatic with an uncooperative brain. Whether it’s from a runner’s high, from sleep-affecting medication, or just from pure exhaustion, it’s funny how the first thing to go always seems to be number identification and arithmetic. Maybe that’s just my own observation, but it seems way easier to take a derivative, for instance, than to subtract 22 from 111.